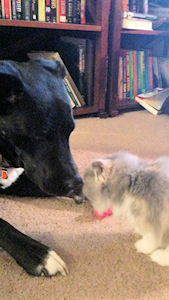 "I also wanted to compliment you on your application, extensive contract and most of all EARLY SPAY/NEUTER. If you have seen our web site you know that we are always drowning in dumped Persians and they usually come to us in horrific condition. 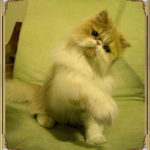 It is very common for us to get in Persians especially that are 4 paw declawed BUT NOT FIXED. Of course this makes me crazy. Most of these I'm sure are pet store and backyard breeder cats but it's a terrible shame all the same. " I started a search for a kitten in July of 2013. The first kitten I found was really cute and I was all excited. Went to work the next day, clicked on my cell phone, and all these warning signs came up. 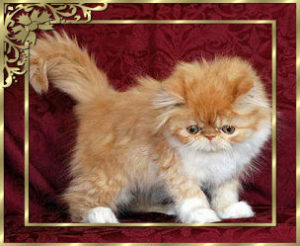 I continued my search and googled "Best Persian Breeder" and Pelaqita Persians came up. I went through her website and found a phone number. I do not know how to email, text, etc. and I just got a new cell phone in June which is how I got Susan's phone number. I finally called Susan after a week and asked if she had any kittens. She said she had a cream boy and a red tabby and white. At that point, I had made a decision that I wanted a black and white or a red and white kitten. Susan was so very kind to me and asked me to fill out a kitten application. 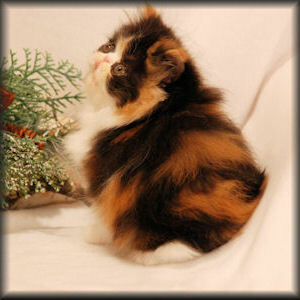 I already knew that I wanted the red tabby and white boy. So, I sat down and wrote her a letter, about myself. I had to get on the internet to see a picture of the little red tabby and white boy. Having no computer, I had to improvise to see a picture of him. I was coming back from the bank and I saw the girls in the office that I knew and asked them to do it for me. There he was, 1 1/2 weeks old and sleeping. I was in love with him! When I got home, I called Susan and told her that I wanted to buy him. I have had cats all of my adult life. I lost my Romeo in July 2013 and knew I would get another cat. My last cat that I went to look at and bought, and was delivered a sick kitten that spent the majority of his life sick. (picture of this kitten when I got him). So it was important to me that I did not get another kitten that was sick. The five year health agreement was really important to me. I got exactly the kitten that was presented to me - a healthy and happy kitten. On a scale of 1-10 (with 10 being the best), I give Susan's kittens a 10+ 4 stars. My experience with Pelaqita Persians could not have been more perfect. 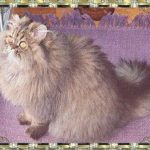 Susan matched me with the temperament and confirmation I was looking for in a cat, and provided me with all the information and support I need to successfully bring a Persian cat into my life. 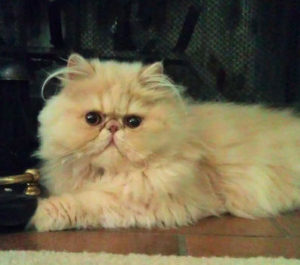 I fell in love with the idea of owning a Persian cat after I found myself following several CATS on Instagram. Every day I looked forward to new, cute pictures of theses smooshed face furballs. 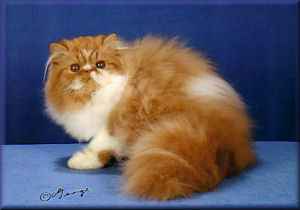 A year after my obsession began I started looking into Persian breeders. I knew if I was going to make the time and investment into pet ownership I wanted the best cat I could possibly get. 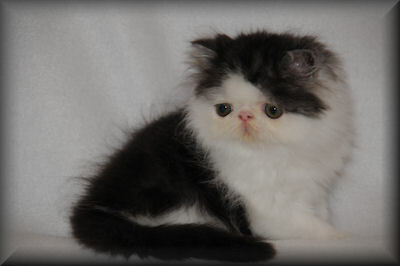 I found Pelaqita Persians and I knew if anyone could deliver my dream cat, Pelaqita could. I filled out the inquiry form and was soon contacted by Susan. We spent a good two hours on the phone chatting and she honestly and expertly answered the ten million questions I had. (I was mostly concerned about the grooming needs and making sure my cat was a friendly cuddleball; Susan assuaged all my fears). 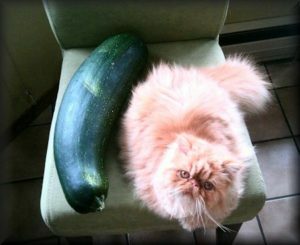 Not to mention, the incredible list of resources on her website for all things Persian Cat. Once we decided on what cat was right for me Susan made the paperwork and the logistics of getting a cat from Ohio to Montana very easy for me. I'm so happy with my pretty little girl CeeCee, and I know that Susan is only a phone call or email away should I need help with anything. Everyone loves my cat; the vet's office voted her "cutest cat they'd seen in years" and the groomers are always delighted when I bring CeeCee in. Plus, I constantly get the "I don't like cats, but I like this cat" spiel from visitors. I can't say enough good things about Pelaqita Persians! I love my cat, and I have Pelaqita to thank for that. 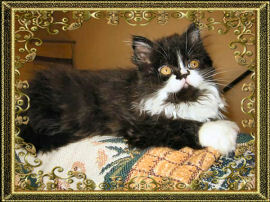 I want to thank you for all the help in selecting our lovely Minuet. You spent hours upon hours with me trying to find out exactly what I was looking for and assisting me with making the best decision for my family. Your knowledge and guidance is extraordinary. Minuet is exactly what I was looking for and I feel she will do well in the show ring. She definitely has been socialized- entertaining every traveler on the flight home from kids to pilots and then never once has hesitating to approach my other dogs and cats. She is a bundle of energy and personality!!!! Again, I appreciate your patience and guidance. 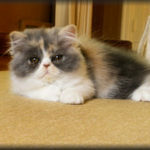 You are dedicated to the Persian breed wanting not only to place your kittens in a loving home, but place each one in the most appropriate home for new owners and kitten personalities. We accidentally found a cat convention in Columbus, Ohio and met Susan... and our new kitten, even though we didn't know it at the time. We picked up Cinnabun and she immediately snuggled into our arms, and she stole our hearts. We weren't planning on getting a cat at the time, but we called Susan from the airport and decided she was going to join our family. Cinnabun is an amazing cat: friendly and loving, playful and feisty. She has an amazing personality and Susan did a great job raising her. Cinnabun was calm after her plane ride and was immediately comfortable in her new home. We feel so incredibly lucky to have wandered into the cat show, to have met Susan and to have Cinnabun in our life. 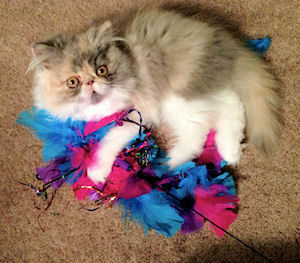 I found Pelaqita Persians in Cat Fancy Magazine in April 2012. There were 38 Persian kitten ads in total, her ad just popped out. DNA testing for polycystic kidney disease and a written 5 year health genetic guarantee. As an animal lover that was so important to me. Once I spoke to Susan MacArthur, I knew that I would not even attempt to call any other breeders. Every question I had was answered and I filled out an application for a kitten and sent in a deposit. On August 23, 2012, I picked up "Ernest" from Newark airport and was amazed at this gorgeous kitten that I had waited for since April 2012. I can not believe my eyes when I look at him. He's healthy, friendly and a little ball of fur. 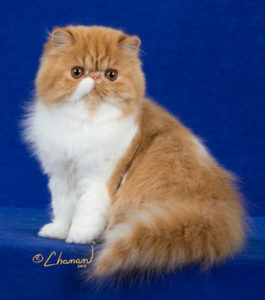 If anybody is considering buying a Persian cat, Susan has made the experience wonderful from start to finish; you will have an ethical breeder who wants to make sure everything goes right. I have made two new friends, "Ernest" and Susan. Ernest is a gorgeous specimen of the breed type. I wanted to write something for your references! I really do appreciate all of your help. Keep an eye out for this week's mail, I will be sending out something soon! Have a great day! I recently got my kitten Bowie from Susan. I can't even begin to explain what a wonderful, and caring breeder Susan is. 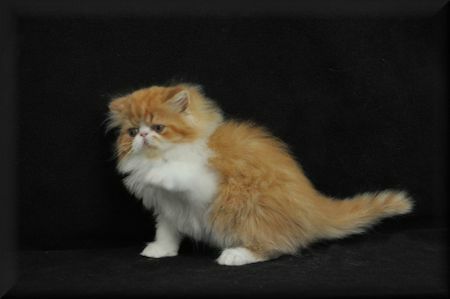 I had always wanted a Persian kitten, and began my quest around last October for a good breeder. I wasn't having any luck, until a friend suggested Susan. I always like to point out how carefully detailed Susan is with her website, and how helpful it has been, and will continue to be helpful. I explained my situation to her, and she was always so prompt with her emails, and explained everything step by step for a beginner like myself. She worked with my situation, throughout the entire year, and shaped my little kitten's personality into a wonderful one. Bowie is a beautiful kitten, and has a very gentle and sweet disposition. I would not hesitate once on suggesting Susan as a breeder. She's caring, and I have not seen anyone care so much about her kittens as she does. It's wonderful to see that my first time as a cat owner, the experience could have not been better. She's absolutely wonderful, and I wouldn't think it over twice on saying that she's a great breeder, and I would love to be a second time customer. I hope this email finds you well. I wanted to send you a note letting you know that He is the most amazing cat ever! We call him Brawny... . He has the softest, tiny meow. He is just a little shadow to the kids and me. He loves these little water balls I got him. He will play fetch...he carries them everywhere..I have them all over the apartment!!!! He has to sit on the ledge of the shower while we are in the shower or in the bathroom getting ready....he is the sweetest, funniest little guy ever! We love him so much and feel so blessed to have him in our family!! Thank you so very much!!!! Our entire family is in love with our newest family member, Cate. She is such a sweetheart and so loving; her favorite place to sleep is curled up around my neck! Cate seems to like her new home, and our other cat has accepted her graciously ... although he could do without her jumping on him constantly! It is hilarious to watch her run all over the house and play. She gets so wound up that she growls as she's "attacking" the toy or scratching post! And she absolutely loves her Life's Abundance canned food; she cries from the moment she sees the can. You can't get it on the plate fast enough for her! Here are a couple photos of Cate- one in my husband's arms, and the other of her standing watch over our son while he sleeps! We are so happy to have Cate home with us- thank you for raising such a beautiful baby kitty! His name is now Sebastian. As you know: He is beautiful! As I mentioned to you on Sunday when we spoke, he just hopped right into the house and settled right in. Sunday night he slept on my husband's head all night in our bed! Every night since then, I've made a little ritual of calling him at bedtime, petting him, carrying him up the stairs, putting him in my bed (hubby has been in DC since Monday), turning out the lights, playing with him for awhile, then he goes fast to sleep next to me. I think he looks forward to all of this as when it starts to get late (11:30 or midnight or so), he now comes to get me! He's eating well (about a half-can in the morning and a half-can in the evenings + dry food is out all the time if he wants any. He LOVES those vitamin supplements! I cannot get over it. He "thinks" they are treats. If I'm looking around and don't see him, I just shake the bottle and he comes RUNNING. He likes to play with toys. He's using the litterbox and has not had even one accident or any problems using it. He's explored the whole place. He seems to love people as he follows my mom around every time she comes over (which is like every day). We are giving him a lot of attention -- and he has not looked "scared" or "confused" or "uncomfortable" at all. It's really nice out today (in the 70's) so now at this moment outside on the screened-in porch looking outside. He saw a giant wild turkey in the yard this morning! I've been working from home all week as I did not want to leave him alone until I know he'll be OK by himself. It's almost like he's always been here, Susan. I cannot explain it. He's very well-adjusted. You did a wonderful job raising him from his birth. He's a joy to all of us and it will only get better! I was going to put him in one room (our bedroom) for a week but honestly, he has not needed it. I know he is not going to go off and hide and I think he prefers to always be where the action is. You have given us a gift of love, smiles, and joy. Thank you so much! 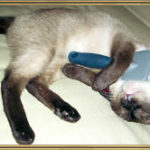 Just had to write and tell you what a lovable, sweet, smart kitty Moochi is. He comes when I call his name (he either knows my voice or his name), he likes to sit on my lap with his head on my hand as I type on the computer, and goes by his food dish and cries when he wants more soft food. I must admit 1 T. of the soft food is not doing it. He cries and cries 'til I give him MORE. I think he's growing bigger and has gained weight in the last week. I was a little worried he would get lost in the house... there's quite a few rooms and upstairs too. Well, I think it took him all of a couple hours and he knows his way all around the house and up and down the front stairs/back stairs. Wow, he's amazing! I don't know if all your cats are this smart. Too bad Herman got fixed. He had some good kittens with Sophia. He communicates better than any cat I've ever had. If he wants something, he lets you know! His eye appears to be doing fine. 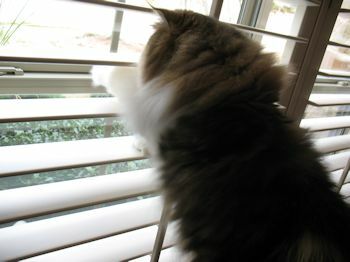 PS: He also loves to look out the window and see all the Xmas lights, kids walking to school, etc. The older kitties are just keeping their distance and doing their "own thing" which is mainly sleeping. I wanted to send you a note letting you know how grateful we are for Hot Rod! When I contacted you and let you know that I was interested in getting another Persian, you were quick to help and let me have little Hot Rod. Derreck and I are so appreciative as he is so much fun and such a joy to have around. He has soooooo much personality! He's quite a character! He has adjusted quickly to our home and to us. He sits on my lap when I am typing at the computer, I call out his name and he comes running, I ask him how his day was and he answers with a thoughtful long look as if he's thinking about it and then replies with a "meow". When I announce "Hot Rod! Treat!" He comes charging and sits on my lap while I try to keep up with his constant chopping and readiness for another treat! I already love him dearly and he is quite a little companion. He's great company and there is never a dull moment with him. He is still a kitten and loves to play and explore. Again, thank you. I will always be in debt to you for such a wonderful friend and companion that I have with Hot Rod. 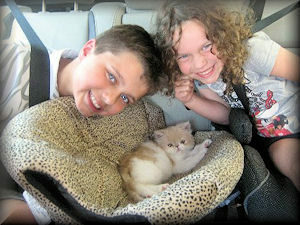 The kitten -- "Siobhan" was very quiet on the way home. All went well. At first she was a little timid and skittish, but NOW she runs freely all over the house and is extremely playful. At night she seems to want to stay under my bed, so I put one of those circular cat beds there for her. Then, in the mornings around 7 AM, she cries to get up in bed with me. She is such a cuddler! Today she was able to jump from the floor into the recliner with me. I was so impressed with how she is able to return to her litter box to use it; hers is upstairs in a back bedroom -- which to my amazement she ran up to use from downstairs -- in the dark. Although I showed her where the downstairs box was (Tigerlily's). You raise beautiful kittens; I appreciate the way they have been socialized so well. Again, I do thank you for all of your efforts in providing me and others with such wonderful pets. I hope that you do not miss her too much -- and please know that she is loved very much! P. S. (2/3/2010) Yesterday the kitten amazed me; I came into my bedroom and she had jumped onto my bed from the floor and was sitting in the middle of it -- on a cheetah print blanket -- so adorable; she had camouflaged herself, almost. Do you think she would have been able to get down by herself -- if she was able to jump up on her own? I placed a storage bin next to the bed so she would have a half-way point to jump to so she could get down okay. This morning she jumped up in bed with me in the early morning -- what a loud purr! (Her purring is bigger than herself). Chloe is great! Thank you again! 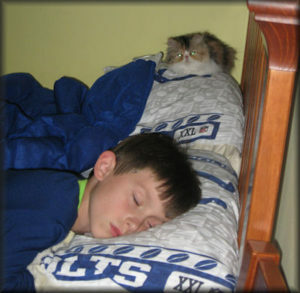 Adopting a kitten from you was such a great experience for our family. We really enjoyed seeing the whole litter and seeing the parents. Chloe is very well socialized and is always with us. We were comfortable right away because of your professionalism, knowledge and experience with the breed. I can't thank you enough; what a wonderfully raised and socialized little guy. He slept almost all the way home, and tackled his new home like he had lived here all his life. No adjustment is obvious to me. My Ebi is showing signs of accepting him more and more as the days go by. Calvin and Hobbes have been wonderful. I love them both to pieces. I call them my 'amazing' kitties. I just can't get over how sweet they both are. They're nice'n healthy, handsome boys and are a joy to share my home with. 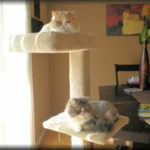 My two older persians (Tess and Tucker) have warmed up to them and everyone is getting along fine. I call Tucker 'Uncle Tucker' now. 🙂 Tess, well she's Tess, but she's okay with them too. Overall, C&H's introduction into the house went without a hitch. The boys took everything in stride. They were great. I showed them the litter box once, and they never missed a beat. I've included a few pictures. As you can tell, they like to get into some odd places. You raise wonderful kittens, and I would recommend anyone get one (or two) of your babies. We celebrated Butternut's 2nd birthday yesterday. 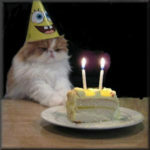 He looked amazed into the candles, enjoyed his balloons and really loving his gold fish. Every morning, he wanted us to bring the gold fish down from the kitchen counter; he would sat next to the gold fish, as long as he would, just stared at it. We just want to thank you from the bottom of our hearts for our newest addition Pika. She is an absolute delight to have in our lives. She's quickly taken on the role of "superstar" in our house to a new level. Pika came to us so highly socialized that she did not miss a beat. She took to her new mom and dad immediately and gets on famously with her brothers and sisters. She is the smartest kitten that we've ever adopted into our house and we love to see her solving her little problems along the way. She loves when guests come over to visit and greets them at the door like our little ambassador. As for playful, she's out of this world. The commitment to health and quality standards you apply far surpass any that we've ever seen. Anyone considering purchasing should rest assured in knowing that you are dealing with the best. Here is the kitty growing up so fast. Happy cats on a lazy Saturday morning. Thank you so much for our precious Ortyn. He could not have been better on the trip home! He was completely relaxed and loved being held by Chase and Chloe. Below are a few photos from the journey home. I have never seen a pet that is so well adjusted, comfortable, and healthy. I attribute this to his wonderful and thoughtful upbringing. 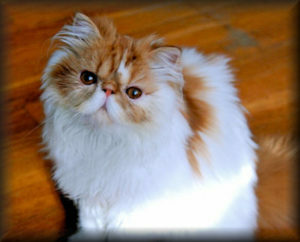 It is obvious that you are truly passionate about the Persian breed. Ortyn is incredibly playful and loving and immediately took to the litter box. He slept on the bed with me and Chloe last night and is busy at play already this morning. Here are a few shots of him this morning. We will spoil him rotten and send photos often. You are the best! 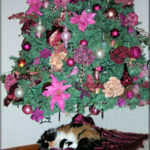 The cleanliness of your home and the kitty areas is unsurpassed. Your web site is incredible and so informative. 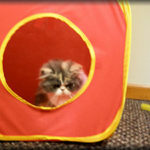 I will visit often to stay up to date on the latest news in caring for persian cats. The entire adoption process was very professional and I could not recommend you more highly. Please do share my letter and photos on your web site. 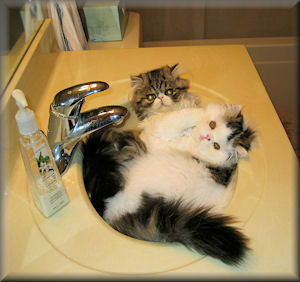 I want everyone to know about your incredible Persian cats and adoption program. Thanks, again, for our precious baby. We wanted to update you on our now three year old kitty, Cocoa. He has the most sweet natured, loving and fun personality of any cat that we have ever had the privilege of getting to know. He is an absolutely wonderful part of our family: he keeps us company during the day, plays with the kids after school, and curls up with them at night. If any of us has had a bad day or is hurt, Cocoa will be right there to help take care of things! He is a very talkative and playful guy who so brightens our days with his presence. He wants to be right in the middle of everything and we just adore him. Thank you so much for all of the love and attention that you gave him. You can really see it in his personality as he grows. Cocoa is an absolutely gorgeous boy who is very much a cat at heart. He watches birds and squirrels from his perches and has definitely impressed upon our smooth Collie that he is the ultimate alpha cat. Thank you also for your professionalism. Your description of Cocoa's personality as a kitten continues to fit his personality as an adult cat. You have an amazing knowledge and sense of your kitties and we are forever grateful that you shared Cocoa with us. He is just a joy to all of us and we cherish every day that we have with him. Mark, Teresa, Megan and Jeffrey Collins and Cocoa too! I just wanted to take the opportunity to thank you for the incredible experience we had in acquiring our two new babies, Feffie and BlueBelle. They continue to light up our hearts and our home. I wanted to especially commend you for creating a seamless transition for the kittens into our new home. I truly appreciate the E-mail interactions, the list of supplies, photos on request and the wonderful adoption process. The kittens were so well socialized when they came to their new home they fit in like they'd been with us forever. Their big hearts are matched by their even bigger personalities!! Additionally, I want to recognize your commitment to excellence regarding the health of your kittens. Dealing with breeder's in the past that has not applied the level of detail and scrutiny that Pelaqita applies makes me appreciate you and your company even more. Again, words can't express our level of gratitude!! We can't tell you how happy we are with our Lily girl. She was a gift from my mother last year as you know. Lily was a part of our family even before I picked her up at the airport, because of all the effort you made sharing photos and information via Internet. The minute she arrived at our home it became hers as well, and that's exactly what I had hoped for. Lily is a beautiful cat, and has a personality beyond explanation! I'm sure your love and care for your kitties is where this came from. We are grateful and thank you for being who and what you are for these precious kittens. You really made me feel as if I were the only one on your waiting list and you shared in all the excitement with me. You are a very special person and I thank you. I wanted to take the opportunity to write this e-mail letter thanking you for our beautiful new addition to the family. As you know we call her Ta Ta. She has a wonderful and sweet disposition. I have never been around any pet that is as easy to care for and is so pleasant to have as a member of the family. I can only assume it is based on your breading efforts. Moreover, she is beautiful and is everything you described. Lastly, I wanted to thank you for your professionalism and the way you walked us through the process in preparing for her arrival. You made it very easy and almost effortless. Please feel free to have any of your future clients contact me for a recommendation. As you know, I am a lawyer by profession. I wish that every business entity I dealt with handled their affairs in a professional manner as you did. I hope all is well. 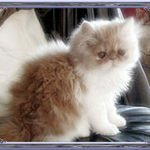 Dealing with Susan in acquiring her young male Persian (Angel Face) has been a very smooth and wonderful experience. She has been very tireless, supportive, and informative in educating and preparing me for Angel Face. I had asked if possible to receive him after me and my wife moved to a new address 3 weeks after, she understood our circumstances and agreed. I had asked for a specific date in receiving him and she gave her best in meeting this date. Her effort in putting up all the necessary documentation and contracts, acquiring health insurance, the extra step of bringing him for additional health check-up, booking the flight (from Denver to NYC) and meeting all the airline requirements for pet-cargo delivery, all proved to us her commitment in making sure that Angel Face will be received in the least stressful manner. In picking up Angel Face, both me and my wife, our hearts just melted at seeing the face of this Angel. What a joyous delight! As soon as he arrived at our new home we could see his tiresome face (from the long journey) and let him find his spot to rest without bothering him, hoping he'd be adjusted by the next day. Not exactly the next day, but the day after that he began his feeding and toiletry routine as if nothing ever happened. We got him the food and vitamins (Nuvet) as recommended by Susan without questioning, as we trust in her judgment of what will be the best for Angel face. Now he's a huge eater! Most importantly, by the second day we were overjoyed to learn of his receptiveness to us. Together with our existing female Siamese cat (who has become his friend), they love to sit on our laps, waiting turns to be brushed, trail us around the apartment, while making endearing 'meows'. Coming home and seeing both their faces receiving us will always be gift that put smile on our faces, no matter how the days have treated us. 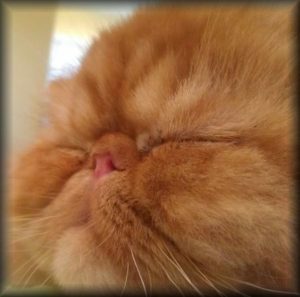 I cannot put in plain words how much we appreciate Susan as the breeder of our newly acquired pet kitty, and would recommend her as the breeder of any prospective owner's dream for the best and most beautiful breed of Persian cats. 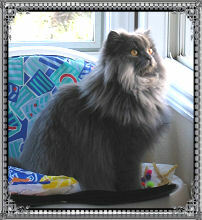 On 12/9/06, we picked up our beautiful Persian kitty that we have named Butternut. Susan of Pelaqita Persians was wonderful to work with. 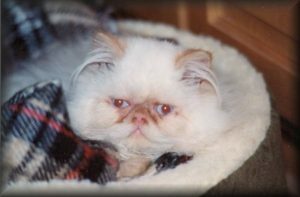 My wife found her Internet site and saw this very cute cream and white male Persian and wanted me to immediately call and get more information. Sue gave us all the information we asked for and much more. I could tell by talking with her how much she cared for her Persians and I knew that we could trust her and we were not disappointed. Throughout the process she kept us completely informed about everything. She gave us an abundance of information along with samples in the mail. And, she let us know that we can always call if we need anything. 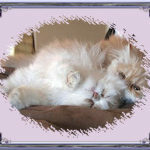 She has been very helpful and has given us many tips for caring for and grooming Persians. Butternut arrived at the airport very clean and he is such a joy for our family. Thanks again Sue! You are truly a star! My name is Vivian and I adopted Fluffy one week ago. I have to say that I was very nervous about shopping for anything on the Internet but Susan has change my perspective about shopping on the Internet. Not only does she make the transaction very smooth, she also gave me all the information that I needed about Fluffy. Susan actually did me a huge favor by keeping Fluffy for one month until my home renovation was over. 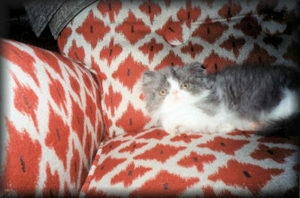 During the one month period, Susan E-mailed me numerous pictures of Fluffy. When it was time for Susan to ship Fluffy to me, she gave him the greatest bath and she E-mailed me all the information about the flight for Fluffy. When I first saw Fluffy, my heart melted, I was very amazed on how clean and cute Fluffy was. During the search for my perfect kitten, I have been to a lot of other sites but never anything like Pelaqita Persians site. 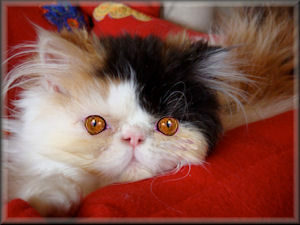 Susan's web site have everything that I need on how to care for a Persian cat. 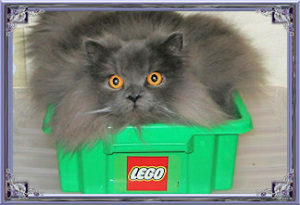 The web site has information on Persian cat grooming, NuVet vitamin supplement, recommended food, toys and a very good supply list. Fluffy is the cutest thing that I possibly can think of. He has a lot of fur which I love and I don't mind combing him 3 times a day. Susan, thank you for everything that you did for me and for Fluffy. 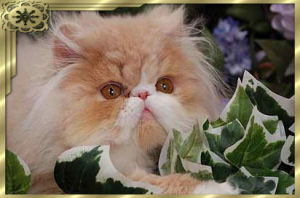 You are not just a Persian breeder to me, you are also my friend. I would definitely recommend Susan to anybody who wants to adopt a sweet and loving cat. Susan, I said this before and I want to say it again, thank you. My name is Kelley Clapper, and I am the proud mommy of baby Hemme. 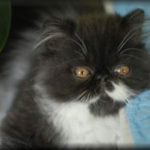 I was looking to get a Persian kitten, and found Susan's web site. I contacted her and received the best person/breeder ever. Susan loves her kitties so much, and her kittens are so much more than any sale to her. We communicated through the entire process of getting my kitten. She really took the time to make me comfortable adopting my boy this way. I was nervous because I hadn't met him, but my specific plan to get a certain type and gender changed when I saw this precious baby in an e-mail she sent me. Hemme was the one and I just knew when I saw his little eyes - so full of personality. Susan took so much of her time, and so much care into getting him ready and safely to me. I appreciate her so much! Everything you could need in the form of education, introducing pets to the house, what the kitty eats, how it arrives, its health guarantee, and so much more was provided and recommended for me to read before even considering filling out my application. My kitten is so beautiful, healthy, and such a well adjusted kitten. Hemme is social and outgoing and is such a good, loving kitty. Even after Hemme has been living with me, I still e-mail Susan for tips, and she has replied every time with great thoughts. Susan continued to make sure I was giving the kitty the very best, including a disc of his photos before he was old enough to come to me. Thank you so much Susan, you have made this such a great experience for me and I would recommend you to anyone in the market for a great kitty and fantastic person/breeder!! We thought it was about time we check in with you since we made our trip, to Texas, last October. 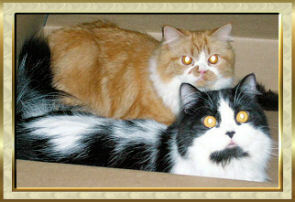 Our new Dad and Mom were really impressed on how well we traveled and used the litter box with no accidents. We were very well behaved and they didn't have to pull the car over, at any time during the trip, to get on to us. And here, we were just 12 weeks old! Since we've been in our new home, we pretty much have everyone well trained. Every morning, Mom prepares our canned kitten food with the NuVet Plus, sprinkled on, that you told her about. We're still eating the Eukanuba Kitten food that you started us on. We are now 10 months old and we sure don't look like kittens anymore! Chester is a big boy and even though I'm not quite as big, I'm the boss. Mom and Dad always enjoy looking at your web site and are so glad that they chose Pelaqita Persians. When they came to pick us up we got to greet them at the door. I just adore my kitten from Pelaqita. Aristotle is so cute that no one can walk by him without stopping to lavish him with attention - especially my husband! He's very affectionate and playful and always uses his litter box. It didn't take him more than a few days to charm his way into the good graces of our other Persians. Susan was very professional throughout my experience and I appreciated all the time she spent with me. I have bought many cats over my life and the home Susan provides for her cats/kittens is by far one of the cleanest and most loving homes I've ever seen for a breeder. She is very knowledgeable about her cats and provided me with many valuable insights and resources. I would recommend this cattery to anyone and look forward to seeing her future kittens. I also thought you might enjoy seeing a few pictures. He was seven months old when they were taken. Baxter plays fetch - with his toy mice but actually prefers wadded-up paper. He spends hours at the sliding glass doors watching the birds and the squirrels. He weighed 9 pounds, 4 ounces at his last vet visit. He is a gorgeous, sweet, friendly cat. The pictures don't do him justice. The hair on his and around his neck still has to grow out a bit from when it was shaved. His tail is outrageous it is so fluffy and big! Thank you for letting me adopt such a wonderful cat!.